Disney films have become a fixture of many peoples’ childhood memories. They’re movies everyone loves to re-watch - even after outgrowing them. The older you get and the more you re-watch them, though, the more likely you are to start noticing something is a little off about certain aspects of these beloved Disney classics. Certain scenes might make you want to pause and rewind to see whatever the hell that was again, just to make sure you’re not imagining things. And boom - there it is - something that reminds you of World War II or a visual that is incredibly racist. Many of your favorite kids' classics are peppered with dark Disney imagery that passed right by you in childhood, but has since come back to haunt your dreams. There’s a lot of loaded imagery in Disney movies that ranges from creepy to sexual to straight-up mind-boggling. Sometimes, these visuals are a little kinkier than you would have expected from a family friendly animated classic. Other times, these disturbing Disney images may evoke dictatorships or a religious hellscape. Take a look at the images below and see just how creepy they can get. At first, we see our puppet protagonist and other young boys being lured to Pleasure Island, a place where they’re free to drink, smoke, and play pool. But things get dark really quickly when each of these badly behaving boys suddenly sprout donkey ears and begin their horrifying, Cronenberg-esque donkey transformations - after which, they are sold off as slaves to go work in the salt mines. Pinocchio manages to fit the topics of abducting children, human bootlegging, and even "loss of childhood innocence" metaphors into one horrifying sequence that surely left a lot of kids traumatized. Remember the scene where the coachman who wants the boys transported to Pleasure Island says, "they never come back as boys"? It is all kinds of creepy. This particular moment comes from a 1943 anti-Nazi propaganda film called Der Fuehrer's Face. 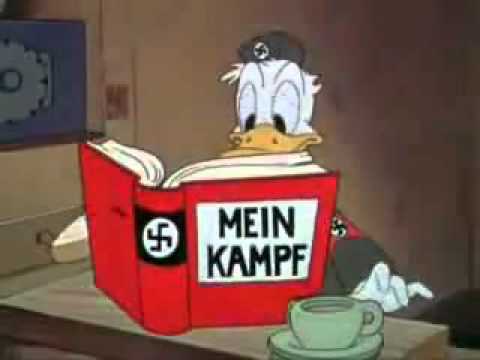 The Disney short was conceived as a way of selling war bonds, and depicted Donald Duck in the midst of a nightmare where he slaves away in a German factory. Of course, it’s all a dream, and Donald wakes up back in the United States, thankful to be in good ol' 'Merica. The Hunchback of Notre Dame is chock-full of some pretty dark subject matter for a musical animated film made for children. So, it comes as no surprise this movie is rife with terrifying imagery, the implications of which may go over the heads of its intended audience. There are definitely a lot of visual stand-ins for sexual repression and religious guilt to unpack. Disney has a long history of tone-deaf, insensitive, and downright racist movies. And it's pretty easy to forget that Fantasia was one of them - especially since Disney tried to deny the existence of its racist, dehumanizing caricature, Sunflower, when they re-released the film in 1960. Disney attempted to scrub all evidence of Sunflower, the centaur handmaid to an Aryan-looking horse-woman, and pretended the whole scene never made it to the screen.